Martha Stewart Living Omnimedia, Inc. and Wedgwood will introduce the Martha Stewart Collection with Wedgwood exclusively at Macy's, a tabletop line featuring 10 fine bone china patterns, six crystal stemware patterns, and six stainless steel flatware patterns, available in the United States at Macy's, macys.com and macysweddingchannel.com beginning in January 2008. 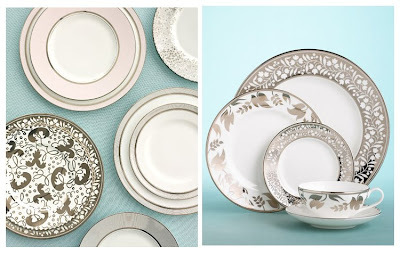 Inspired by some of Martha's favorite pieces of china - modernized for the needs and tastes of today's discerning bride and entertainer -the Martha Stewart Collection with Wedgwood has been designed by MSLO, in collaboration with Wedgwood, bringing together the distinctive Martha Stewart palette and patterns with Wedgwood's 250 years of manufacturing excellence, creating a thoughtful, beautiful line of tabletop items available at the largest department store wedding and gift registry at Macy's. From the simple to the elaborate, artful details and signature Martha Stewart colors allow for a traditional display or can be intermixed to create a personalized look. 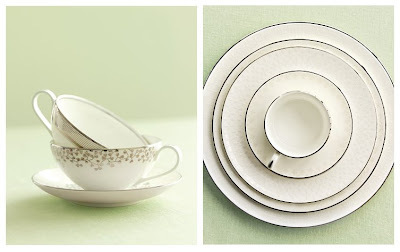 Each china pattern is available in 5-piece place settings, ranging in price from $99-$159; tea and coffee services and a full complement of serveware are also available. 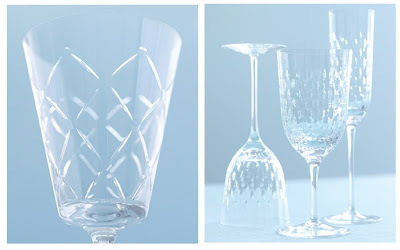 Each of the six-stemware patterns offers Wine, Goblet, Flute, and Iced Beverage styles and range from $30 to $37 per stem. 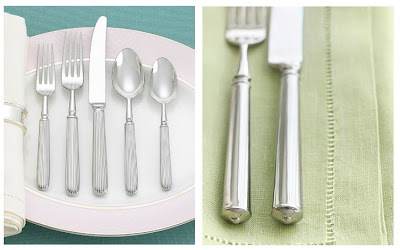 The flatware's larger size reflects Martha's preference for a heavier, more substantial eating utensil, with designs spanning traditional, transitional and modern styles and ranging from $45 to $60 for a 5-piece place setting. "I have always been an avid collector of fine china, crystal and silver, and my personal collection includes many Wedgwood pieces I am very proud to own. Our new line with Wedgwood offers a range of beautiful and timeless pieces that can be collected and enjoyed for years to come just like my antique pieces," said Martha Stewart, Founder of MSLO. "We are thrilled to work with Martha Stewart and offer a blend of tradition and innovation to our customers," said Lou Scala, President of Wedgwood and Rosenthal and Chief Marketing Officer for all Waterford Wedgwood Brands. "This collection reaffirms our classic vision which is the perfect marriage of Wedgwood's history and expertise, inherent in both the Wedgwood and Martha Stewart brands. Our exclusive with Macy's positions us for continued advancement at the forefront of the luxury market." "This collection speaks to our brand's ability to embrace artful living and entertaining and bring that to consumers. Tabletop settings are essential in every home and an important part of our expanding home program. 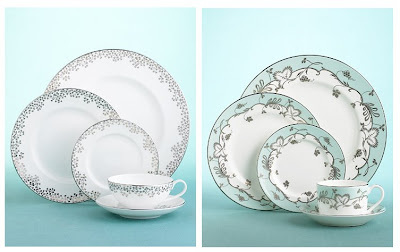 By collaborating with Wedgwood, we have designed a unique product that will have the quality and taste that both brands are known for," said Robin Marino, President of Merchandising for MSLO. "The Martha Stewart Collection with Wedgwood is a natural extension of the Martha Stewart Collection home products that debuted in Macy's stores this past September," said Tim Adams, chairman and CEO of Macy's Home Store. "This is another incredible union of the 'best in class' - Martha Stewart's wedding and entertaining expertise, Wedgwood's manufacturing distinction, and Macy's robust national wedding and gift registry." Lily of the Valley - A richly decorated pattern inspired by treasured Lustreware, capturing the shimmering essence of the original 19th century classics. Ribbon Stripe (Available in Silver, Gold and Rose) - A simple tailored band inspired by an antique French pinstripe pattern, is updated for today's contemporary lifestyle. Flourish (Available in Ecru or Robin's Egg Blue) - A classic vine motif reinterpreted with Ecru and Platinum or Martha's signature Robin's Egg Blue with Platinum. Bouquet Silver - A stunning silver rendition of a signature sepia-colored Transferware pattern, featuring jewel-like accents in both shiny and matte platinum. Petal Lattice - Inspired by one of Martha's favorite pieces, the simple lattice design of raised enamel against a matte ecru background, is dramatically contrasted by the modern floral design of the accent plate. Garland Moss - A design of lovely pale green accented with lavish garlands in raised gold paste that combines two elements of Martha's own favorite antique plates. Banded patterns from two of Martha's favorite plates are combined to create a richly decorated pattern in moss green with lavish garlands in raised gold paste. Wedding Band Taupe - A sophisticated banded pattern of complementary gold and taupe is one of Martha's personal favorites. Bracelet (Silver and Gold) - A simple crystal stem with a metallic band of platinum or gold to be dressed up or down for any occasion. Shower - A pattern of shimmering ovals creates an illusion of raindrops to illuminate any table setting. Petals - A flower blossom at the base of the stem creates a stunning design from within. Trellis - Inspired by a lattice design, the pattern features round cuts inside each square to add sparkle and shine. Circlet - A handsome barrel shape is perfect to showcase the classic crown cuts that inspired this pattern. Cadenza - Sculptural with an intricately detailed scallop design and subtle curve at the base. Chorale - Inspired by traditional chopsticks, it is clean, simple and the epitome of modern design. Canto- The perfectly smooth pattern, which is flat on top with a simple scalloped end, rests gracefully on the table. Serenade - All about simplicity with its very smooth surface and gently curved handle. Aria - Hollow-handled to give dimension and weight, featuring a smooth round handle with an elegant cap on the end. Sonata -Hollow-handled featuring exquisite ribbed decoration.